A book about the history of (popular) music by Zainichi – Korean minorities in Japan – was published. 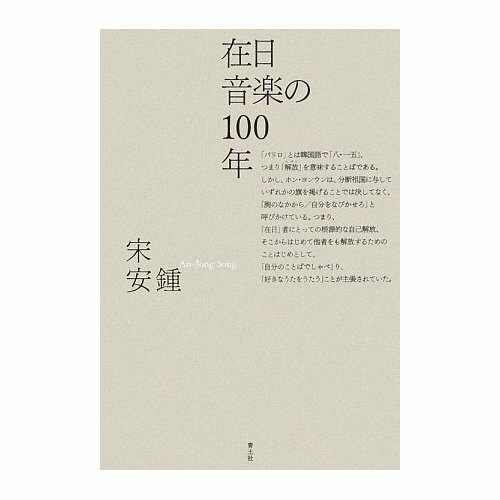 The title is A Hundred years of Zainichi Music (Seidosha, 2009.2). The author is An-jong Song (Song An-jong 宋 安鍾 in East Asian style) who has been teaching at Kanazawa University and one of Korean minorities in Japan himself. Below is the translation of the table of content. 7. Are the songs of the refugees from North Korea pulsating in Korean-Japanese music? 3. Where is Zainichi music going to? Below is the table of contents in Japanese original. It would be appreciated if anybody let me know the wrong and incorrect translation. ← [IIAS workshop] East Asian Popular Music: Small Sounds from Big Places?